(Nanowerk Spotlight) A few years ago, researchers determined that the stiffness of cancer cells affects the way they spread. When cancer is becoming metastatic, or invading other organs, the diseased cells must travel throughout the body. Because the cells need to enter the bloodstream and maneuver through tight anatomical spaces, cancer cells are much more flexible, or softer, than normal cells. Using atomic force microscopy (AFM), a team from UCLA conducted a nanomechanical analysis of cells from cancer patients and found that the stiffness of metastatic cancer cells taken directly from patient samples was more than 70% softer than the normal cells in these samples (The results were reported in Nature Nanotechnology: "Nanomechanical analysis of cells from cancer patients"). "Even when compared with patients suspected of different types of cancer – lung, breast and pancreas cancers – we found the same results," Sarah E. Cross, a scientists at California NanoSystems Institute and first author of that 2007 paper in Nature Nanotechnology, tells Nanowerk. "With this knowledge, we wanted to understand the cell mechanics associated with the anticancer treatment of cells from patient samples; in particular we were interested in reporting the effects of green tea extract due to the fact that is was a natural product, it has know anti-cancer effects and it is widely consumed in beverage form around the world." In addition, green tea extract (GTE) associated anticancer activity in cell lines – such as urothelial and lung adenocarcinoma lines – have been reported; however, the direct effect of GTE on metastatic or normal cells from clinically obtained human samples had not been studied before. The UCLA team, lead by James K. Gimzewski, professor of chemistry and biochemistry, and Jian Yu Rao, an associate professor of pathology, has now reported the effect of a green tea extract on live metastatic cancer cells and benign mesothelial cells taken from clinical patient. "Our findings demonstrate that GTE has a strong effect on the functional properties of metastatic cancer cells in both human cell lines as well as live, clinically obtained patient samples," says Gimzewski. "Unlike other chemotherapeutic drugs, the selective effect of GTE on cancer cells but not the non-cancer cells in the same specimen provided basis for developing GTE as an alternative novel agent for localized cancer therapy." In their new work, reported in the March 30, 2011 online edition of Nanotechnology ("Green tea extract selectively targets nanomechanics of live metastatic cancer cells" – free access article), the team again used AFM to probe the biomechanical properties associated with the ex vivo treatment of ten different human body fluid samples (pleural effusions) with GTE. "We studied pleural effusions taken from the lung, rather than primary tumor masses, as it provides a native control due to the presence of both mesothelial (normal) and tumor (metastatic) cells in this type of sample, and is used routinely in pathological clinical diagnosis," explains Rao. In their experiments, the researchers optically aligned individual cells under the AFM tip via optical microscopy. Using AFM software, the tip was brought into contact with the central region of a cell and force curves were obtained. Force-displacement curves were recorded on each cell to determine the relative cell stiffness (Young's modulus) of the cell. Cross says that the measurements show that GTE increased the stiffness of the metastatic tumor cells from 0.41 ± 0.18 kPa to 2.54 ± 1.47. "Our results indicate that GTE causes a significant increase in the measured elasticity of the tumor cells in these patient samples, to a stiffness value quantitatively analogous to normal, healthy cells. Interestingly, no significant change was detected in the biomechanical response of the normal cells before and after treatment with GTE, indicating a very selective action on the metastatic cancer cells." 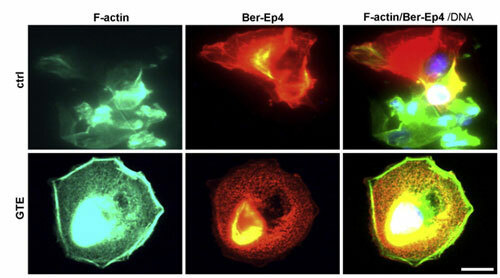 The scientists found that the presence of GTE caused a significant increase in the level of F-actin, which in turn led to increased cell stiffness. While GTE has consistently shown a strong anti-cancer effect in both in vitro and in vivo models, efforts on human clinical trials with oral intake of GTE are hindered by unclear bioavailability of GTE. "This is the first natural product that has ever been approved as a drug by the FDA" says Cross. "Our findings provide evidence which suggests that direct application of GTE to the body cavity may be effective to treat metastatic cancer with minimal side effects such as those associated with other conventional chemotherapy drugs." The interesting findings of this work may lead to studies of how other anti-cancer drugs affect cancer cell mechanics. More specifically, researchers might try to investigate whether the mechanical properties can be a quantitative marker for drug sensitivity/resistance, etc.